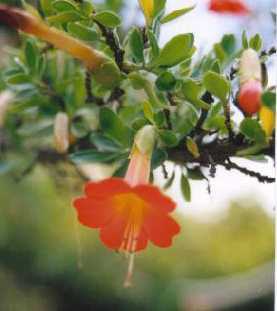 The Kantuta Fund takes its name from the Andean tri-color flower pictured at right. The Fund was established in 1991 by Amigos members, all former Peace Corps Volunteers (PCVs) and staff attending a Peace Corps reunion in Washington, DC. The original mission of the Fund was to provide funds for small grants for PCV-related projects in Bolivia and Peru; for joint projects with other non-profit or similar organizations operating in Bolivia and Peru; and development projects initiated by Amigos de Bolivia y Peru directly. It continues to re-connect Returned Peace Corps Volunteers to our two countries of service and to facilitate their involvement in grassroots development efforts in the Andean region. The specific objectives are to support projects which fill a need, are sustainable and require participation by the community or recipient organization, involving their provision of labor and/or in-kind resources. Since late 2005 (in Peru) and mid 2006 (in Bolivia), all Kantuta funds have been directed to support Peace Corps volunteers' projects, as a result of a decision by Amigos' Board of Directors to better focus its efforts on Peace Corps. This redirection was implemented via written Donation Agreements negotiated with and signed by the Peace Corps Country Directors in both Bolivia and Peru and continue in force today. Funds are provided directly to each Peace Corps Country Director upon request and Board approval, and the in-country staffs select meritorious projects from proposals submitted by PCVs. Peace Corps staff in both countries are assigned to implement the terms of our Donation Agreements. They are required to communicate regularly with the Board of Directors of Amigos, reporting on the progress of the Kantuta-funded projects and providing final reports that include detailed financial accounting and programmatic evaluation. 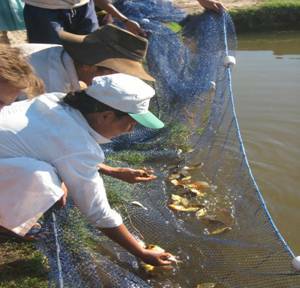 In the decade of the 1990s, the Kantuta Fund provided small grants to a number of projects in Bolivia. Peace Corps had been invited back to Bolivia in 1990, after an absence of two decades. Kantuta recipients at that time included a mix of projects -- some PCV-initiated, others to nonprofit organizations working in Bolivia. Among the PCV projects funded were small business development efforts to capitalize a village-level savings and loan cooperative, to construct wells for water, and to increase the capacity of a community library. Kantuta funds also provided financial support to La Paz-based Pro Mujer, a non-governmental organization (NGO) that provides women micro -credit loans, using the Grameen Bank model. Funds also were provided to The Resource Foundation for a watershed restoration project through FUNDESIB, another Bolivian NGO. Agriculture PCV Stephen Cooper used $95 to purchase plants for an experimental center aimed at plant diversification in Chocloca, Santa Cruz. Aaron York (Colonia Linares) and Meaghan Leatherbury used $50 and $189 respectively to promote alternative cook stoves in their communities. Another $189 was granted to Heidi Gerling to train a women's group (right) to preserve local fruits and vegetables in Saipina. Costs of seeds and tools ($148) were awarded to Justin Taylor to create a garden at an elder care center in Sucre. Katherine Conant applied for $46 to purchase two hard drives to repair donated computers in San Isidro. A grant of $35.26 was used in Salitral -- Campo Verde to replace fish (right) stock lost in earlier transit. 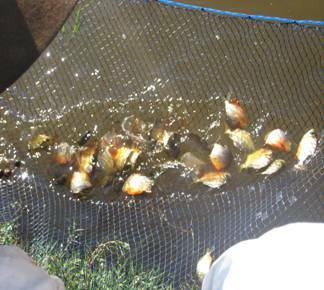 The availability of the new fish allowed the community's fish farming project to proceed. 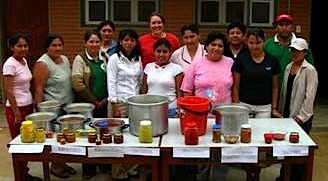 Prior to Peace Corps' re-entry to Peru in 2002, after an absence of almost three decades, the Kantuta Fund supported projects that generally benefited Peru, including support for a new national park through The Resource Foundation and a women's beekeeping project. It also provided funding to AIDEP for micro-lending and to Northwest Medical Teams for village healthcare. With a grant of $700, PCV Jason Overdevest coordinated the construction of 17 latrines in nine rural villages surrounding Chalaco, Piura. The communities were intimately involved in the latrines' construction and in classes on proper use and maintenance of the latrines. Each community contributed 200 adobes per latrine, tiles for the roof, and most of the labor. PCV Kevin Fitzpatrick worked with his community (Canchaque, Piura) to build a demonstration facility for raising swine. The objectives were to create a new source of income for the community and to enrich residents' diet with protein-rich meat. USAID Small Project Assistance funds were used to construct the facility. Kantuta funds ($100) were matched by the community to purchase materials (bricks, cement, steel, plastic tubes, and plumbing fittings) for building a bio-degester to capture methane gas from pig manure for use as cooking fuel. PCV Laura Beranke mounted, in Catilluc, Cajamarca, a community campaign centered on the prevention of AIDS and other STDs. Community-wide educational events, using a youth brigade of health educators, were capped by a community health fair. Kantuta funds ($100) were used to purchase supplies for this effort. Another grant, for $500, was awarded to PC/Peru July 2007. Of this amount, $400 was expended on an innovative seed project, (pictures below) enabling a dozen PCVs to establish full-fledged gardening projects in their communities -- for school, family or communal gardens. The seeds are purchased domestically and are suited to local growing conditions. The expectation is that the products will not only represent a new source of income in the community but will also improve the nutritional status of the residents. Additional funds are needed so as to support earthquake recovery efforts by Peru PCVs and Crisis Corps (now called "Response") volunteers who will be working in the affected areas. Plans are underway for PCVs to provide youth development, health and environment services and to assist in rebuilding infrastructure -- latrines and housing -- via PC/Peru's partnership with CARE. The Kantuta Fund is a very effective way to affect international development, with 100% of your donation going to poor communities where PCVs serve. And it represents a mechanism for those of us who served in Bolivia or Peru to give back to the countries that hosted us for the "hardest jobs we've ever loved." In so doing, we can assist our successor PCVs and staffs to make their own contributions. To continue to support this truly grassroots program and respond to community-defined needs, Amigos would appreciate your financial contribution. Your check, payable to Amigos de Bolivia y Peru, should be accompanied by the Membership Form (http://www.amigosdeboliviayperu.org/join.htm) or a note. Include your name, address, phone number and email address, as well as the country to which your donation should be targeted. If you wish to split your contribution between Bolivia and Peru, please designate how the money should be split. 7327 University Avenue, Glen Echo, MD 20812. Amigos de Bolivia y Peru, Inc. has been granted 501c(3) status as a nonprofit, tax exempt organization by the Internal Revenue Service. Each donation is tax-deductible and will be acknowledged by a written letter, verifying your contribution and our tax-exempt status.